NETWORK UPDATE: Just when it seemed as though things couldn’t get worse for MULANEY, they did, as the show fell 0.1 in final numbers to 1.0. MADAM SECRETARY and THE SIMPSONS each gained 0.1. SUNDAY NIGHT FOOTBALL adjusted up to 8.2, a big 1.6 above last week’s Sunday night game. Sundays belong to AMC and THE WALKING DEAD, which towered over everything except the night’s football game at 7.71 (down 1.06 from last week’s season premiere). 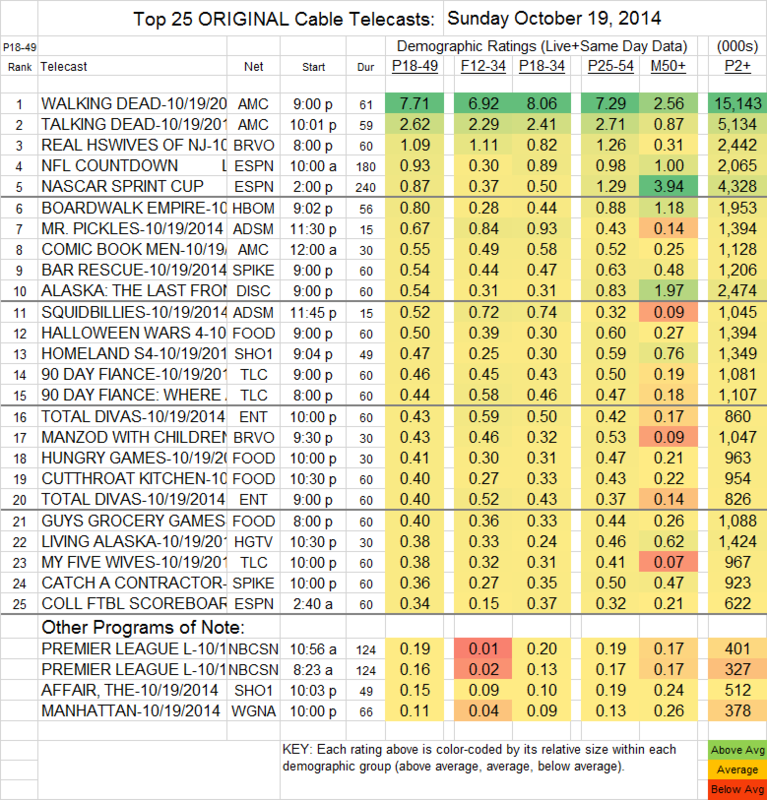 Companion show TALKING DEAD was again #2, down 1.12 from last week to 2.62, with COMIC BOOK MEN down 0.07 to 0.55. REAL HOUSEWIVES OF NEW JERSEY (Bravo) climbed 0.11 to 1.09. The next-to-last episode of HBO’s BOARDWALK EMPIRE was up 0.14 to 0.80, and LAST WEEK TONIGHT, which had taken last week off, returned at 0.29. On Showtime, HOMELAND was up 0.03 to 0.47, and THE AFFAIR edged up 0.01 to 0.15. On Adult Swim, MR. PICKLES fell 0.11 to 0.68, and SQUIDBILLIES dropped 0.16 to 0.52. ALASKA: THE LAST FRONTIER (Discovery) was down 0.07 to 0.54. The season finale of MANHATTAN (WGN America) was up a (for this show) mighty 0.04 to 0.11.